BEAU Albrechtson intends to complete Kaimuki's uprising in the Hawaiian Airlines/HHSAA Boys Basketball State Championships this time around. The Bulldogs are making sweet music together lately, thanks in no small part to Albrechtson. The 6-foot-4 forward-center is also the lead singer and guitarist in his band, Local Uprising. He has helped lead his team to the same position they enjoyed last year as Oahu Interscholastic Association champions. Peaking at the right time and hitting their stride, the Bulldogs are coming off a 56-45 win over Kalaheo in the OIA title game. Now Kaimuki, ranked third in the Star-Bulletin's poll of coaches and media, must prove it's still in a rhythm by maintaining its inspired play today against Saint Louis. But it's been a decidedly up-and-down-then-up-again season. Expectations were high this year, but the 'Dogs went 19-8 overall with a mediocre 7-5 OIA mark entering postseason play. Then they rattled off four straight in the OIA tournament, with wins over Waianae, then-unbeaten Mililani, Radford and the big one over the Mustangs, who had shrugged them off twice in the regular season. Albrechtson is one-third of Kaimuki's three-headed offensive monster that includes seniors Daniel Colon, a sharpshooting guard, and Keone Reyes, a powerful low-post presence who lives up to his team's nickname. "I think we are playing on a totally different caliber," said Albrechtson. "We had a bumpy season ... how we had five losses and stuff. In the beginning of the season our team got kind of big-headed." The three were the primary returnees for coach Kelly Grant after Kaimuki's remarkable run to the state championship game last season, in which they fell to powerhouse Iolani. "After we started losing (this season) we said, 'We really gotta work harder,' " Albrechtson said. "During the playoffs we really stepped it up. We started playing how we were supposed to be playing all season." He explained that he, Colon and Reyes have participated in the Main Event summer basketball tournament in Las Vegas for the past four years, helping get a feel for each other's games. That cohesion helped when Colon got a steal and fed Albrechtson for a breakaway dunk in their OIA title win. It gave Kaimuki a critical second-half basket, and pumped up the Bulldogs players and fans. He finished with 17 points, matching his season average. "He's playing more aggressive (than in seasons past)," Grant said. "He's learning how to play more physical, improved his shooting. His whole total game has improved." Grant sees him sliding in at small forward if he plays in college, so he encourages Albrechtson to work on his ballhandling with both hands. The southpaw displayed some versatility Friday by going to 3-pointers when the opportunity presented itself -- he went 2-for-2 in the contest. He is also one of a select few high school players in the state who can pull off a dunk in an actual game. Grant estimated that he's done it five or six times this season. "He needs to change up his dunk though," joked Colon, his longtime teammate, adding it's the same two-handed tomahawk style every time. "I wanna see him drive down the lane and dunk on somebody, or catch an alley-oop." Looking back, the lanky 17-year-old realized Friday's slam was one of the few times he threw one down and didn't get whistled for a technical foul. He has a habit of pulling himself up on the rim to avoid landing on earthbound players. Albrechtson's mom, Nikki Holbrook, is a director at Kapahulu Bible Church Preschool. She's probably as responsible as anyone for Beau's increased aggressiveness around the basket this season. Last year, Beau averaged a little more than 12 points per game. This year, he scored a season-high 27 against Kahuku on Feb. 1. "Sometimes I wish I played on the mainland, 'cause they won't call any of that," Albrechtson said. 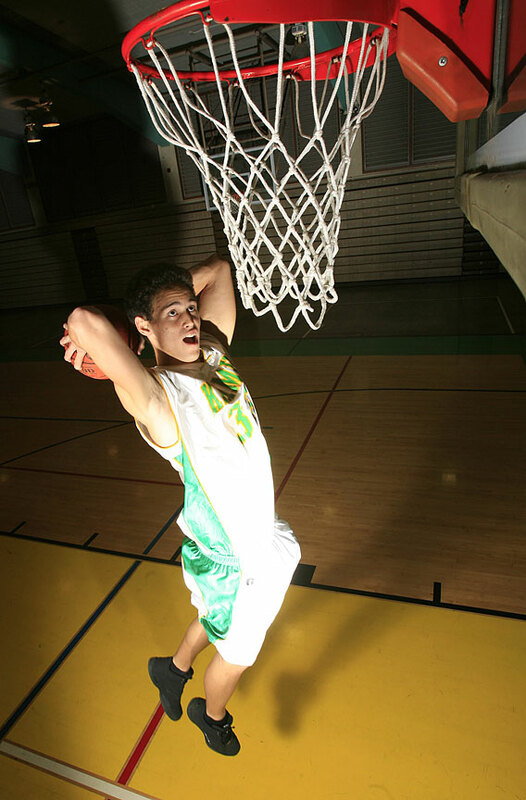 "My mom told me at the beginning of the season, 'Bring dunking into Hawaii.' I've been trying, and I kept getting techs." But he's been working on jamming in more ways than one. Albrechtson, a former Honolulu Boy Choir member, learned how to play the ukulele at 11. He is one of four members of Local Uprising, which formed out of Kaimuki High's Ohana Mele music class. The group -- Albrechtson (lead), Sam Vaitului (drums), Ethan Neves (bass) and Justin Edwards (ukulele) -- has been around for about a year. They perform one or two gigs a month, and get together a couple of times a week. Holbrook acts as their booking agent. "We play about anything," Albrechtson said. "Local music, mostly like reggae, we play some oldies, some rock." To help his group's versatility, he's in the process of learning the piano. Recently, they performed at the Pro Bowl's Family Day event at Kapiolani Park, as well as at events for Sassy & G Magazine and DARE for Kauai intermediate school students. How do the other Bulldogs rate the Uprising? "They work at it," Colon said. "When they try to play some rock songs, it doesn't work out." Critics aside, Beau's efforts have paid off. He carries a 3.2 grade-point average and has three possible colleges picked out -- the University of Hawaii, Pacific University (Ore.) and Whitworth College (Wash.). He's not sure where to go yet, but is leaning toward staying at home to keep his band together, even though Pacific has offered him a $30,000 scholarship over four years. Albrechtson considers himself an athlete first -- he's also into volleyball and paddling -- and musician second. Beau's mom had him pegged for athletics early; she's 5-11 and father Kip is 6-2. Apparently, she planned for the future when it came to naming her only child. "At a volleyball game, everybody was yelling, 'Go Bows!' That's how I got his name. 'Cause I thought one day he'll be playing sports up at UH, and when everybody's yelling 'Go Bows!' he'd think they'd be yelling for him." It looks entirely possible; Beau plays club volleyball for Dave Shoji, and entertains the thought of making the UH volleyball roster. The future wasn't always this certain for him. Beau doesn't know his father, so Holbrook had him join Big Brothers Big Sisters more than eight years ago so he could have a positive male figure in his life. Joseph Wills, 34, has been Beau's Big Brother over that whole span. They see each other less often now, but he makes sure to catch all of Kaimuki's games. "Maybe when he was 8 or 10 we'd go out to play basketball," Wills said. "I gave as little chance for him to win as possible. I told him, 'I'm taking advantage of it now, 'cause one day you're gonna dunk on me and roof me.' "
It didn't take too long; Joe is 5-6. Beau is still growing. Albrechtson didn't hold a grudge, and nominated Wills for Big Brother of the Year in each of the last few years for the bond they share. On Jan. 20, Wills won the award. All that's left for Albrechtson at this point is making good on the team's second crack at the state title. The road will be tough, with the Bulldogs potentially facing all three Interscholastic League of Honolulu teams, including No. 2 Iolani in the semifinals and top-ranked Punahou in the championship game. "Whoever we play, we gotta be prepared for it," Grant said.